Casio is releasing the G-Shock MTG-B1000RB to celebrate the 20th Anniversary of the MT-G (Metal Twisted G-Shock) line of watches featuring cases made of stainless steel and resin. The first MT-G watch was the analog GC-2000 released in November 1999. The following year, the “MTG” prefix was adopted and the line continued in various forms including analog-digital, digital, and analog versions. It is now primarily known as a luxury analog line, though the digital and affordable MTG-M900 (amazon) is still an active series. 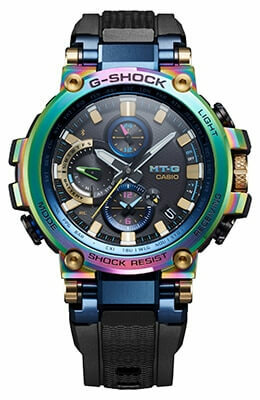 The special edition MTG-B1000RB features rainbow ion plating which refracts light in multiple colors to evoke a lunar rainbow. As the name suggests, a lunar rainbow is is produced by moonlight and is extremely faint and difficult to detect with the naked eye unless it is completely dark. This model has a soft urethane band and the special packaging also has a rainbow IP finish. The MTG-B1000RB is based on the MTG-B1000 which is the first Bluetooth-connected MT-G watch. Notable features include Tough Solar power, a carbon fiber-reinforced case, sapphire crystal, and Triple G Resist. The MTG-B1000 is also known for its innovative new design which is smaller than the previous MTG-G1000. Casio America announced the MTGB1000RB-2A for a June 2019 release with a list price of $1,000 USD.